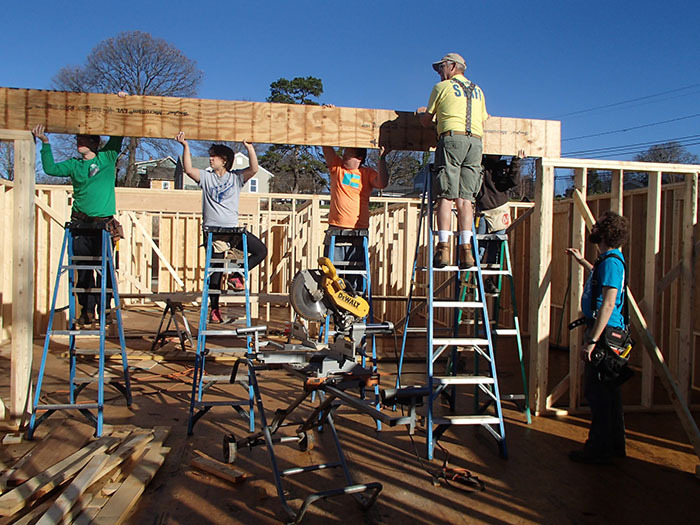 WKU’s Habitat for Humanity Campus Chapter is sending a volunteer group to Mobile, Alabama, next week (March 7-11) to assist with building homes. WKU’s Habitat for Humanity Campus Chapter will be sending a volunteer group to Alabama during spring break March 7-11. The WKU group will be assisting the local Habitat for Humanity affiliate in Southwest Alabama in Mobile with framing of a new home and various other projects as part of Habitat’s Collegiate Challenge Program. Participants are Bryan Reaka of Bowling Green, faculty member in WKU’s Department of Architectural and Manufacturing Sciences; Imari Hazelwood of Lebanon, a staff member in Student Support Services; student team leader Theresa Ford of Louisville, a junior Elementary Education major; Kelsey Settles of Owensboro, a freshman Nursing major; Gabrielle Hoffman of Owensboro, a freshman History major; Michaela Jones of Paducah, a sophomore Mechanical Engineering major; Bethany Vogt of Murray, a freshman Civil Engineering major; Caleb LaGrange of Goshen, a junior Construction Management major; Matthew Millay of Guston, a sophomore Biology major; Jordan Pruden of Bowling Green, a senior Financial Planning major; Konnor Jones of Bowling Green, a senior Chemistry major; James Bryant of Hazel Green, a sophomore Meteorology major; and Rebecca Zimberg of Nashville, Tennessee, a sophomore Accounting major. Collegiate Challenge is an alternative break trip program run through Habitat for Humanity’s Youth Programs and volunteer mobilization department. The program offers students an opportunity to volunteer with Habitat for Humanity affiliates from across the country during breaks in their academic year. Habitat for Humanity is a nonprofit, ecumenical Christian organization dedicated to eliminating substandard housing and homelessness worldwide and to making adequate, affordable shelter a matter of conscience and action. Habitat is founded on the conviction that every man, woman and child should have a simple, decent, affordable place to live in dignity and safety. The program works to build houses and hope in communities. Students learn a great deal about building, issues of substandard housing, working and living within a community, cultural differences in different parts of the country and most of all themselves as a result of the program. During the trip, the WKU students will pick up hammers and swing into motion as they begin framing of a new home for a partner family in Mobile. The students are eager to learn new skills while helping a family in need during their spring break experience. While some students head off to the beach the students who have chosen to participate in the Collegiate Challenge program from WKU will be sharing their talents and learning new skills during their trip that will stay with them for a lifetime. Habitat for Humanity of Southwest Alabama (in Mobile) was established in 1988 by a group of passionate volunteers. These volunteers worked tirelessly to fundraise, acquire land, select families and manage all of the logistics to build the first Habitat homes in Mobile. The name was changed to Habitat for Humanity of Southwest Alabama in May 2011 with the expansion into Washington County. Since then, Habitat of Southwest Alabama has become one of the largest affiliates in Alabama and on the Gulf Coast, celebrating the construction of over 200 homes. Today Habitat for Humanity has completed more than 600,000 homes around the world, completing the construction or repair of a home at the rate of one every 5.5 minutes.